Frieda Loves Bread: Tacquitos. Baked. Not Fried! 5 Tacquitos. Baked. Not Fried! A very good friend of mine is an excellent cook. Better than that, she's spent some time in Mexico and has several authentic Mexican recipes that she has taught me. These are great to make, freeze, and take out, and bake. I had a can of Costco's roast beef (or brisket, 12 oz) and thought it would make a great tacquito. I also found some extra shredded chicken with cheese in the freezer, so I thawed that out. You can cook your chicken in the microwave or poach it on the stove. My favorite method is to use my pressure cooker, which cooks my chicken straight from frozen! 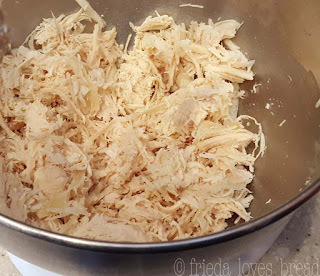 Shredding cooked chicken, beef or pork is SO fast and easy when you use your electric stand blender or hand mixer! There is a favorite bouillon/spice blend that I love to use in my Mexican cooking. It is Knorr Caldo de Tomate, or Tomato Bouillon with Chicken Flavor. I use the powdered form. I have found a 35 oz size at Walmart that I use and keep in the fridge. They also sell smaller bottles. I use this seasoning in my enchilada sauce, Mexican rice, chicken enchiladas and chicken tacos. Crispy corn tortillas filled with seasoned shredded chicken or beef and cheese, are great as an appetizer or as finger foods at a gathering. 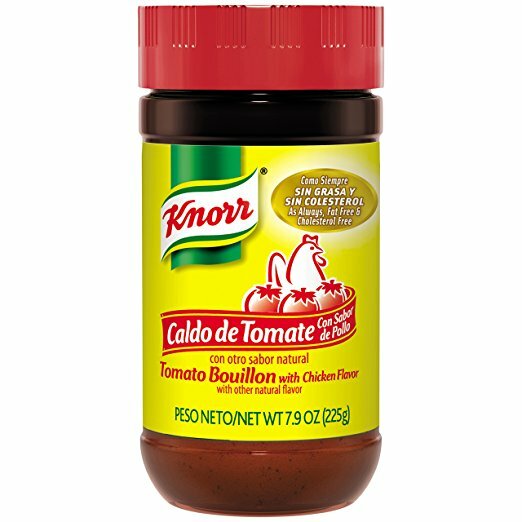 Knorr Tomate Chicken bouillon is a powder that can be found in the Mexican or Hispanic aisle of your grocery store. 1. Mix together the cooked chicken or beef with cooked onions and spices. 2. Put 5 corn tortillas on a microwave safe plate and cover with plastic wrap. Microwave at HIGH/100% for 30 sec - 1 minute.3. Lightly spray a baking sheet.4. Put 2 Tablespoons of meat filling, in a line, on one end of the warmed tortilla.5. Lift edge of tortilla up over the filling. Press down and pull back, making a tight log. Roll tortilla all the way to the other edge and put seam side down on a baking sheet. Repeat the process with remaining meat mixture and tortillas.6. Lightly spray cooking oil or brush tops of rolled tortillas with cooking oil.7. Bake in a 357°F preheated oven for 15-20 minutes. Serve hot, with salsa, guacamole, and sour cream.FREEZER: Tacquitos can be made ahead of time without baking them. 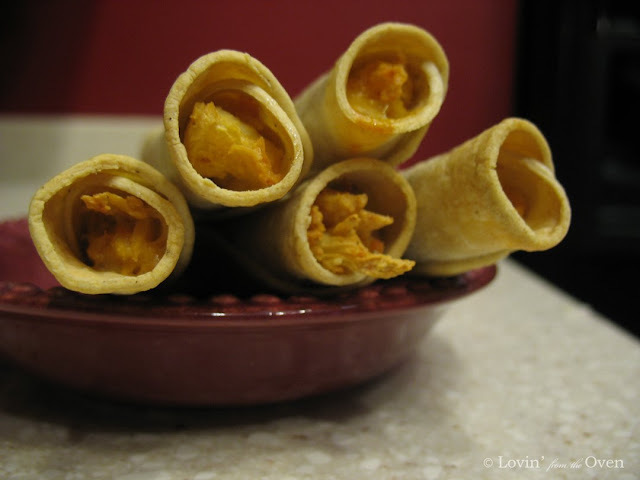 Put baking sheet of rolled tacquitos in the freezer. When firm, about 2 hours, put tacquitos in freezer safe baggies and return to the freezer, up to 3 months. Use same baking time to cook the frozen tacquitos. I can't wait to try this! I love taquitos! Thanks. I am always buying these at the store. I am going to try and make them myself next time. Yummo! I'm going to bookmark this recipe. Thanks so much for posting it. PS - I LOVE Costco, and I love that powdered tomato bouillon too... it's one of my secret weapons!